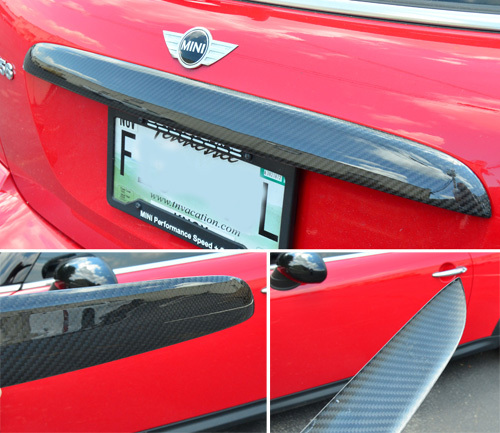 Synopsis: Want more Carbon Fiber on your MINI? After years of hearing customers cringe when we tell them the price for the John Cooper Works rear hatch/handle plinth I went out and found an alternative that is more affordable but has the same look. This real carbon fiber handle cover is a great fit and installs in minutes with the supplied ultra high bond and super thin double sided tape. It will cover the full handle so you don't see any gaps and looks fantastic once installed. For about 1/2 of the price of the JCW part it's a good option for saving some $$.